Well...isn't this awkward. -Rolls eyes- I don't think Kim is Kim-pletely in love anymore. I did not shed any tears. I'm sure many of us didn't. There are far more important and significant things in the world than that topic. 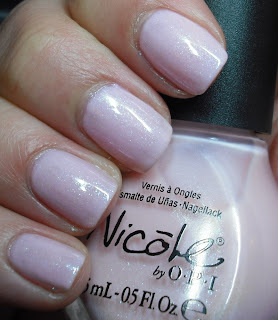 Anyways, I actually was drawn to this Nicole by OPI polish when first I saw swatches. I've always liked the sheer-jelly pale pinks and nudes, so this one was on my list. I've seen other peoples swatches of this and they get a an even look with 3 coats. I still had streakiness with 3 coats? I always have this problem with shades like this, and it really ticks me off. I'm not sure what I'm doing wrong. Maybe, I need polish underwear? Maybe I need to wait longer in between coats? Maybe I need to stand on my head, bark like a dog, and make a cucumber salad? Do I need to praise some polish unicorn mermaid fairy goddess? Whatever the magic secret is to this please let me know? This is a beautiful polish. I recommend it if you love polishes that give you a clean look that have a touch of pizazz. I'm just annoyed that colors like this are such a pain in the acetone! The whole Kardashian clan needs to just go away. I didn't no shed one single tear for her. ANYway...this is a pretty color, though I don't imagine I'll be picking it up (pastels and I don't play well together). Happy weekend! Oh my GODS. I laughed through this whole post. Steph, you SLAY me! This is one of the few polishes I wanted from this collection, I like it. But yes, these colors are such a PITA. The color looks lovely on your nails. A very girly pale pink :) The name? irony at it's best. The application? - idk, were you wearing the clown shoes? If not, that could be your problem? Pale pinks always look so good on you! I've been back and forth with this collection. Have you gotten any others yet? Tis is beautiful and I'm totally lemming it!